It wasn’t that long ago that consumer demands for better animal treatment sparked the rise of the cage-free egg. Hens moved from the confines of 67 square inches to the wilds of the barn, with space to walk and stretch their wings — but rarely, if ever, outside. The pasture movement goes further, sending animals outdoors for ample sunshine and space to spread out. Compared with cage free, pasture is tantamount to bird paradise. At the same time, premiums are coming down. 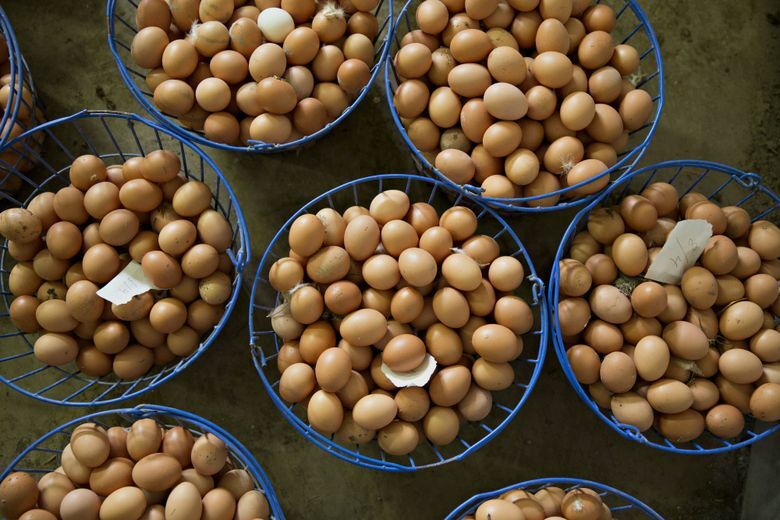 Pasture-raised eggs used to fetch a whopping $12 a dozen at supermarkets. Greater competition among farms and lower costs drove prices down to below $5 recently in some stores. As giants like McDonald’s and Walmart pledged to upgrade, the cage-free hen population has exploded to 60 million in the U.S., double what it was in 2016. Cal-Maine Foods, the biggest U.S. egg producer, said in June it had increased its cage-free capacity. Voters in California passed a ballot initiative this month ensuring all eggs in the state are cage-free. “Cage-free is going to be a commodity egg,” said John Brunnquell, president of Egg Innovations, the biggest pasture-raised and free-range producer, with 1.2 million chickens. Increasingly efficient cage-free farms are driving down costs, and soon those eggs “will dominate the landscape,” said Brunnquell, who supplies Whole Foods Market’s 365 private-label brand. As that change takes place, demands for better welfare are likely to keep increasing, and that’s where the pastured egg comes in. To be sure, even at $5 a carton, pastured eggs still fetch a hefty premium that many consumers aren’t willing to pay. Standard grade-A large eggs averaged $1.78 a dozen in the 10 months ended Oct. 31, government data show. Pastured and free-range eggs are also still a small sliver of total production. Out of 330 million hens in the U.S. egg industry, fewer than 10 million go outside, Brunnquell estimates. There are also incentives for farmers to make the switch. Producers can get higher, more-sustainable incomes and longer contracts by offering pastured eggs, industry executives said. Vital Farms says it has a long waiting list of farmers who want to supply the brand. Dan Arnsperger, president of Rogers, Arkansas-based free-range producer Happy Egg, said the company has 33 small farms in the U.S. and may add 15 to 20 next year. He estimates that 30 percent of shoppers are willing to pay the premium for free-range eggs because of animal-welfare concerns.